When there’s something serious on the line, that’s when players try their hardest – and THAT is definitely the best time to be watching sports. A triple play. It may end up as the most important triple play in major league history. A rookie catcher, in the biggest game of the season, making his first career start behind the plate in the majors. 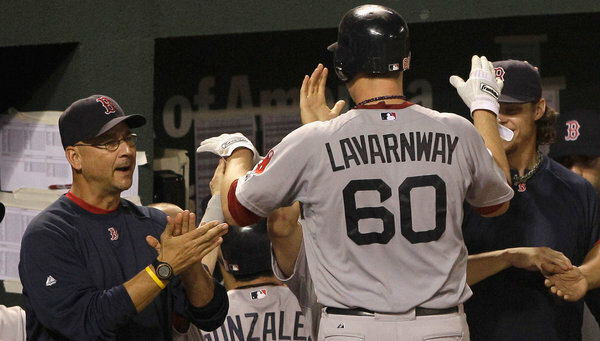 That catcher — Boston’s Ryan Lavarnway, only the third Yale player drafted since 1965 to reach the big leagues — throwing out a baserunner trying to steal third base and then hitting a three-run home run, the first of his career. And then hitting his second career home run. An intentional walk … to bring Alex Rodriguez to the plate. The Red Sox hitting a guy cleanup who has never started in the cleanup position before. Nick Swisher doubling off the center-field wall, but Mark Teixeira not scoring from second base on the play. Jacoby Ellsbury showing why he may be the AL’s Most Valuable Player with another clutch home run. Adam Jones, fouling off pitch after pitch from Jonathan Papelbon with the tying run at second base in the bottom of the ninth, Orioles fans standing like they had a playoff berth on the line. Matt Joyce, Matt Joyce, Matt Joyce. You made Tampa Bay fans very happy. Like i said, I love it when sports matter. These things happen. I personally like the interview the best. He also has made (adapted and directed) the best Boston movie I know of in Gone Baby Gone. The Departed is great but Baby is better and more boston-ish. I did like Klosterman’s recent article about the meaning of perfection and how Brady and the Pats relate. Check it out here.